It is with profound sadness that I announce the passing of Firefighter/Paramedic Lieutenant Chris Hill. Chris's passing is a deep loss for us all. The insidious cancer that he lived with for the last 18 months shows no remorse and leaves little solace for any of us. I had the honor of promoting Chris to Lieutenant on August 12, 2012, and my wife and I have carried the honor and duty as we have helped Chris and his family through this time of turmoil. Staff and union officials are with the Hill family currently, and will be returning to the county soon. I want to thank the West Manheim and Penn Township Pennsylvania Fire Departments for standing guard over Chris and his family until we could arrive. Please continue to keep Chris's wife Jenn and his children Amy and Evan along with the entire Hill family in your thoughts and prayers. 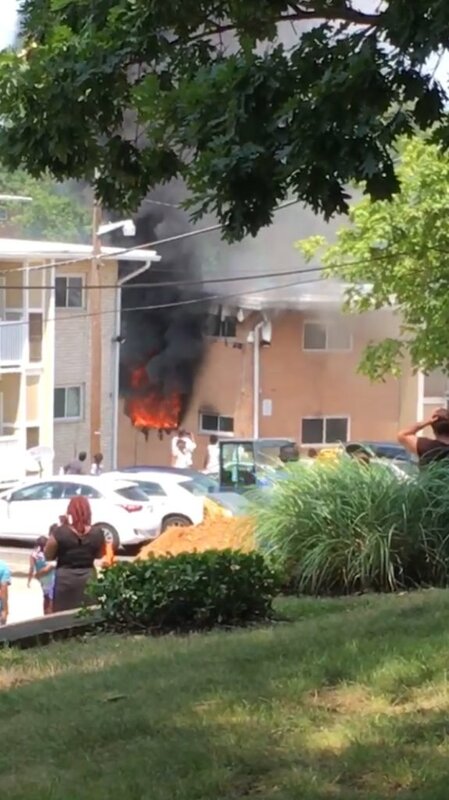 One firefighter was injured and 10 residents will be displaced as a result of a District Heights apartment fire today. At around 1:30 pm, Thursday, July 21, Prince George’s County Firefighters were alerted to an apartment fire at 1942 Rochelle Avenue. Firefighters arrived to find a garden style apartment building with fire showing from a first floor apartment. Firefighters searched the building for occupants and quickly extinguished the fire. All searches were negative. Fire Investigators determined the cause of the fire to be accidental. Maintenance personnel performing work on pipes inside the apartment ignited the fire. Fire loss is estimated at $150,000. Three apartments were damaged and residents displaced. The American Red Cross provided ten residents, 4 adults and 6 children, temporary assistance. Conditions on arrival. Image from DCFDRescue3 Twitter Page.